Capacitors are electrical components, similar to resistors and inductors, that impede the current in a circuit. Unlike a resistor that dissipates current, however, a capacitor stores energy in order to preserve the voltage in the circuit. Capacitors use an electrical field to store energy. Like capacitors, inductors are electrical components used in a circuit to impede changes in the current or filter out certain frequencies. An inductor stores energy in a magnetic field, which preserves current across the circuit. Capacitors store energy in an electric field. Inductors store energy in a magnetic field. In a capacitor, energy is calculated in terms of voltage. The voltage is determined as the difference in potential energy between the two separated plates. A capacitor resists changes in voltage by storing energy in the electric field created by the plates and gap. As a current is applied to the circuit, charges accumulate on the plates of the capacitor. Therefore, voltage cannot change instantly across a capacitor. A current cannot pass across the plates of a capacitor. In an inductor, energy is calculated in terms of current. An inductor resists changes in current in the circuit. When a constant current is run through the inductor, a magnetic field is created. As a property of the magnetic field, when the current suddenly increases or decreases, the current within the magnetic field will change in the opposite direction. This resists, or impedes, the change in current across the circuit. The inductor inhibits the current from changing instantly. A current can pass through the wire of an inductor, but it will create a magnetic field as it does so. If an AC current is applied to a circuit with a capacitor and a resistor, voltage (or EMF) will lag behind the current (dependent on capacitance and frequency), because the capacitor is resisting changes in voltage. If a DC circuit is applied instead, the current will begin high and decay to 0. In this case, the charge on the capacitor accumulates as the current continues until the potential difference within the capacitor is too great of an opposing force for the current. If an AC current is applied to a circuit with an inductor and a resistor, current will lag behind voltage (dependent on inductance and frequency), because the inductor is resisting changes in current. With a DC current applied, the current will start off low and increase to a steady state, as an inverse to the capacitor. This occurs because the magnetic field in the inductor is resisting the sudden change in current that occurs when the DC current turns on. When the current is shut off, the magnetic field will resist the change again. Capacitors are best for conducting high-frequency signals. They can be used to block out low-frequency signals or noise. The size of the capacitor can change the range of frequencies that are filtered out, and different sizes of capacitors can be combined. Inductors conduct best at low-level frequencies, and filter out high-frequency signals and oscillations. Inductors can be used in tandem with capacitors to restrict the range of frequencies in the circuit. Because capacitors conduct well at high frequencies, they are commonly used in high-voltage power supplies, where they can filter out noise. Traditionally, they have been used in situations where very large capacitance and power levels have been needed, such as in radar. They are also used for electronics like radios that use oscillating signals, in which one plate of the capacitor can discharge and the other can charge instantly. Capacitors are also commonly placed next to microchips to block interference from DC signals; in this case, they are de-coupling capacitors. 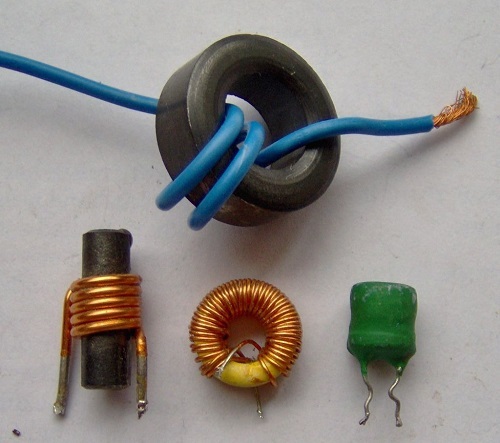 Inductors are popular across a wide variety of modern electronics and appliances. TVs, radios, and spark plugs are all everyday uses for inductors. In situations where frequencies or resonance are important, inductors can be combined with capacitors and resistors to amplify or restrict the oscillations in the circuit. Traditional inductors are usually too large to be used with modern microchips, but surface mount inductors are being manufactured small enough for today’s electronics. Other inductor types have additional capabilities, like the use of coupled inductors in transformers. 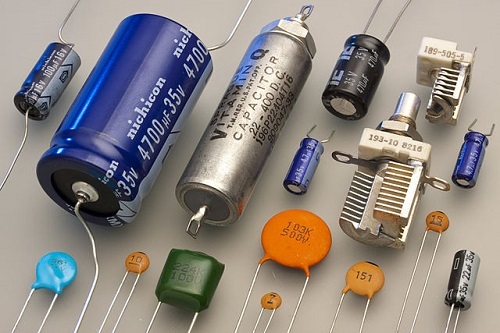 Capacitors and inductors are similar electrical components that impede the current in a circuit; unlike a resistor, they store the energy instead of dissipating it. A capacitor stores energy in an electric field, while an inductor stores energy in a magnetic field. Capacitors resist changes in voltage and current does not pass through them; inductors resist changes in current and conduct. Capacitors work best at high frequencies and inductors work best at low frequencies; they can be combined to filter out unwanted signals or frequencies. Kelsey Robarts. "Difference between Capacitors and Inductors." DifferenceBetween.net. July 16, 2018 < http://www.differencebetween.net/technology/difference-between-capacitors-and-inductors/ >.